GBPCAD Breaks Down, More Losses Ahead? We believe that the Canadian dollar will experience further gains in the week ahead. Although USD/CAD hit a high of 1.29 this week, it rejected that level on the prospect of a NAFTA deal and less dovish comments from the Bank of Canada. At their last policy meeting, BoC Governor Poloz and Deputy Governor Wilkins outlined their dovish bias but their tone seems to have changed this past week. In a speech to the Financial Committee, Poloz said inflation is on target and the economy is close to potential. With a NAFTA deal imminent, we expect the Canadian dollar to outperform in the week ahead as long as GDP, the trade balance and IVEY PMI reports don’t disappoint in a significant way. Although USD/CAD itself looks bearish, we particularly like selling GBP/CAD given the back to back weakness in U.K. data including Friday’s GDP report. Technically GBP/CAD rejected the 50-day SMA at 1.7950 and now appears poised for a move down to 1.7580, which is where the 20-week and 100-day SMA converge. AUD/USD – More Gains Ahead? AUD/USD traded higher today, extending its gains on the back of U.S. dollar weakness. While there were no Australian economic reports released overnight, AUD/USD traders were relieved that Australia has also been granted an exemption from Trump’s trade tariffs. Although Australia’s steel and aluminum exports are nominal (only about US$213 million each), psychologically this decision highlight the strong relationship between the U.S. and Australia although both parties denied that this had anything to do with military support. Regardless, the Australian economic calendar is light with the exception of some speeches from RBA officials this week – the last we heard from RBA Governor Lowe, although they maintain a firmly neutral policy the next RBA rate move will be up not down because the economy is moving in the right direction as non-mining spend rises by the largest amount since the financial crisis. Technically, AUD/USD broke out of a 4 day consolidation and appears poised for a move to at least 79 cents. 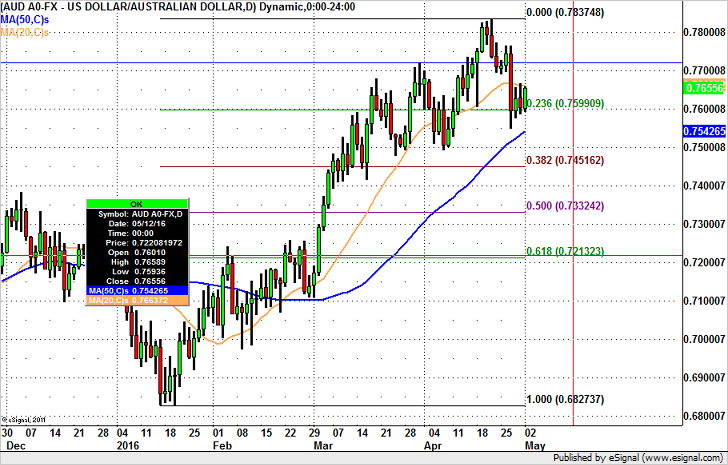 The 50-day SMA sits at .7893 and if that is broken, the next stop for AUD/USD should be the Feb 16th high of .7988. If AUD/USD fails at .79 cents and moves back below .7835, the losses could take the pair to the bottom of its recent range near .7780. 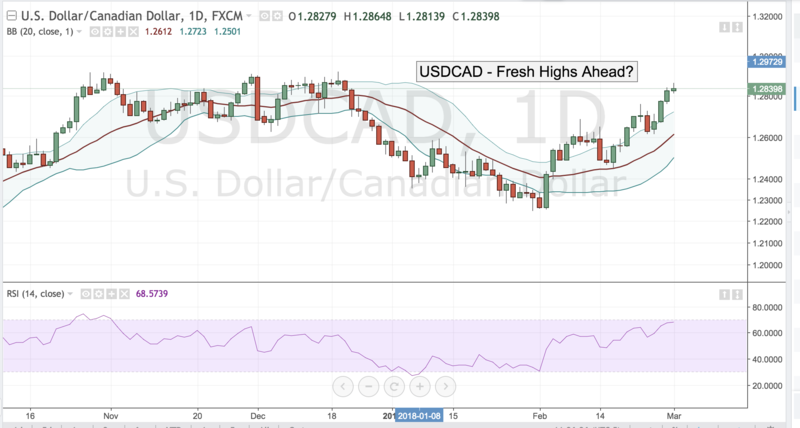 USDCAD – Fresh Highs Ahead? The loonie has been one of the weakest currencies against the buck this week. The pair has been affected by everything from risk aversion flows to NAFTA concerns to capital outflows. But the underlying reason for its weakness is the market’s appreciation of divergent monetary policies between the two neighbors. With the Fed clearly taking a more hawkish stance the interest rate differentials will begin to weigh on the pair as we move through the year. That’s why tomorrow’s CAD GDP data could be of great interest to the market. The consensus view is for a decline to 0.1% versus 0.4% and if that numbers prints the pair could test the 1.2900 level in the aftermath of the release. 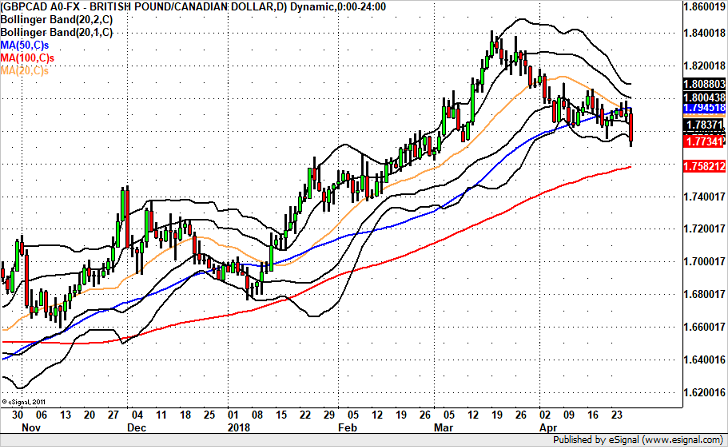 Having now barely cleared the triple overhead resistance at the 1.2850 level USDCAD stands poised to test the key 1.3000 mark if the data does not go its way. 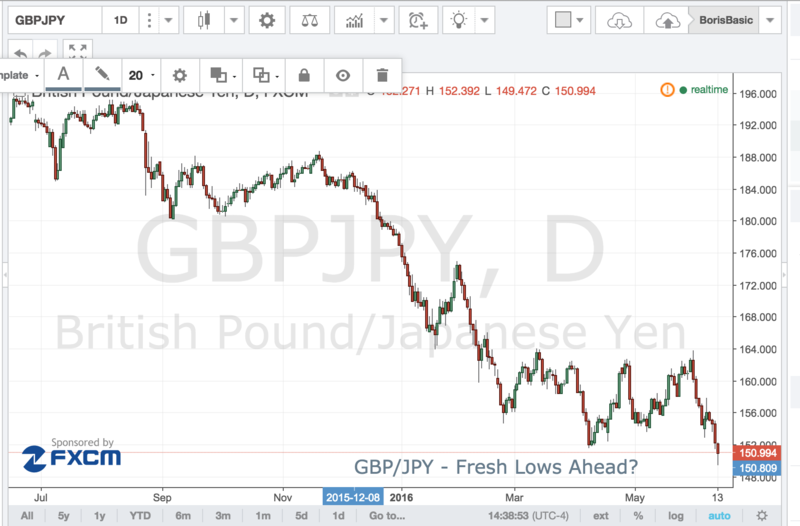 GBP/JPY – Fresh Lows Ahead? GBP/JPY made yearly lows today dropping below the 150.00 level before recovering slightly ahead of the North American close. The pair is at the intersection of the perfect storm in the Brexit trade as it stands to either benefit or suffer the most from the results. The Brexit story is not only a story about the UK economy but also about the stress on global capital markets. If UK were to leave EU it could start a trend that could unravel the current economic order and send markets into massive selloffs which is why along with the decline in GBP USD/JPY has been dropping as well. Of course if the risk passes the relief rally would trigger a swift short covering move in both pairs. For now the GBP/JPY remains under pressure and another test of 150.00 could open the way towards 145.00 while the upside is capped at 155.00 until the referendum vote provides clarity. The main focus tonight will be on Australia and the Reserve Bank’s monetary policy announcement. At their last meeting the RBA left rates unchanged and said, “Under present circumstances, an appreciating exchange rate could complicate the adjustment under way in the economy.” Investors interpreted these comments to mean discomfort with the current level of the currency and sent AUD tumbling lower as a result. There’s a small subset of investors looking for the RBA to ease this month because CPI declined in the first quarter and activity slowed according to the PMIs. However according to the following table, consumer spending rebounded, business confidence improved, the unemployment rate declined and market indicators ticked upwards. So like many of their peers, the RBA may wait and see how the economy performs in the next month before taking additional action. 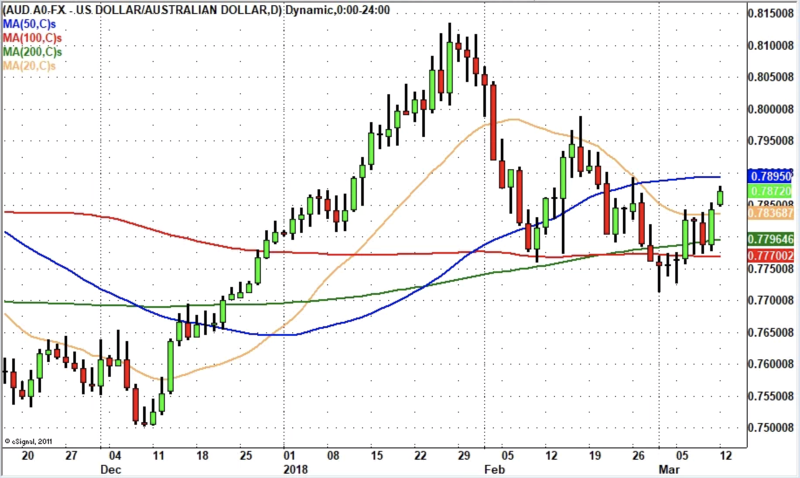 Technically the uptrend in AUD/USD remains strong as long as the currency does not close below the 50-day SMA at 0.7540. Resistance is at the March high of 0.7722 and support is at the moving average. 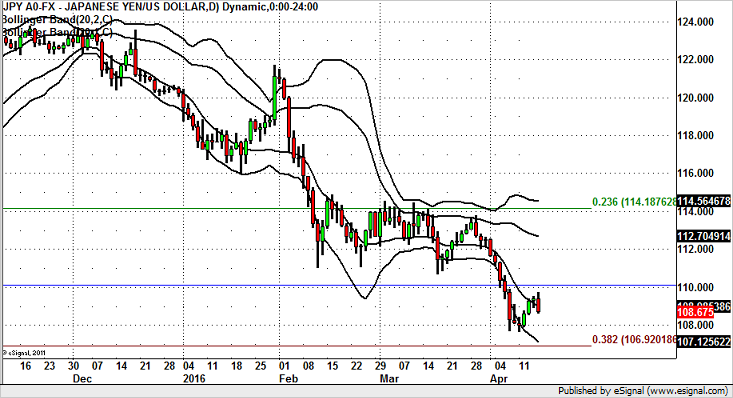 If the upside barrier is breached, AUD/USD will aim for its April high. If the moving average is broken, 75 cents will be tested with a possible move down to 0.7450. After a relatively shallow 3 day rally, USD/JPY resumed its slide and we believe more losses are ahead. Fundamentally, this week’s U.S. economic reports have been mostly weaker. Between the surprise drop in retail sales, tepid CPI growth, contraction in industrial production and deterioration in consumer sentiment, the Federal Reserve has zero reasons to raise interest rates in April OR June. The only way that a rate hike would occur in June would be if retail sales rose 0.5% or more in each of the next 2 months AND wage growth accelerates AND inflation rises. But before investors even start considering tightening in June, they will likely need to contend with a dovish April FOMC statement that addresses the recent deterioration in the U.S. economy. So we expect the dollar to extend its slide in the coming days with USD/JPY looking particularly vulnerable after the recent earthquakes in Southern Japan. Technically, USD/JPY has fallen back below its first standard deviation Bollinger Band which is a sign of the downtrend resuming. Resistance is at the psychologically significant 110 level and as long as USD/JPY remains below this level, a test of the April lows near 107.65 is likely. GBP/CAD – Test of Old Highs Ahead? 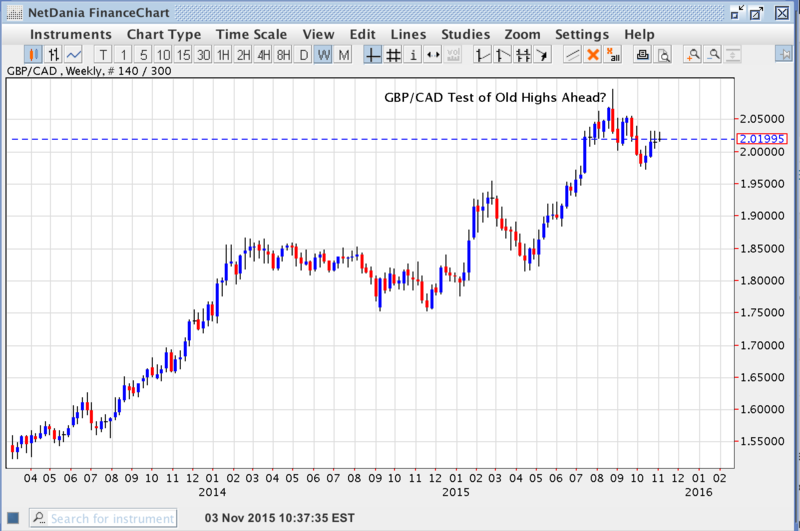 One of the cleanest uptrends over the past year has been in GBP/CAD pair which continues show no signs of exhaustion. After taking a breather from fresh highs above the 2.0700 level the pair looks ready to roar higher especially if UK data continues to impress. Earlier this week the UK PMI Manufacturing report came in much better than expected, but the true test of the state of the UK economy will come tomorrow when the market gets a look at the PMI Services data. If that release beats expectations than the BoE will have little choice but to consider tightening by year end.